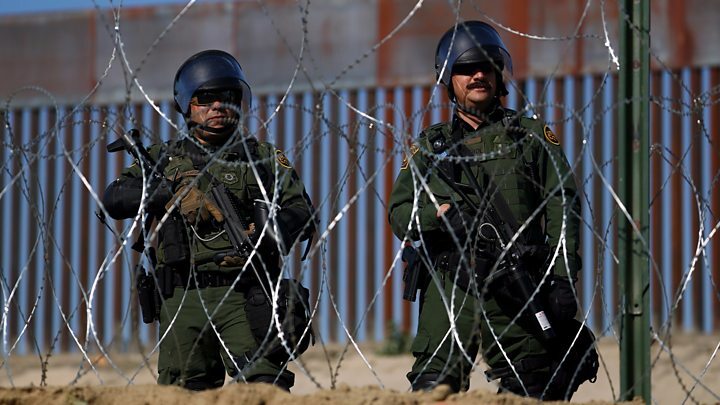 Video footage shows dozens of people – including women and children – running towards the fence that separates the two countries near the city of Tijuana. Amid growing desperation on Sunday, the group of about 500 migrants were taking part in a peaceful protest for the right to seek political asylum in the US. “We aren’t criminals! We are hard workers,” they chanted. Mexico’s Home Secretary, Alfonso Navarrete, said the group had asked for help to organise the demonstration, but were then reportedly encouraged by some of the movement’s leaders to split into different groups so they could make a run for the border and try to cross into the US. It was a day of some drama in Tijuana. After two frustrating weeks in their temporary camp in a municipal sports centre, around 500 migrants joined the peaceful march by carrying banners and chanting pro-migrant slogans. Once they managed to get past the security cordon, though, it quickly turned into a dash for the border. Unsurprisingly, they were meet with force. Tear gas was fired and the US and the Mexican authorities closed the San Ysidro border crossing . That caused long delays in both directions and angered people like Jose Fajardo. Like many residents of Tijuana, he lives on the Mexican side but works in in the US city of San Diego. Yet even as they were being forced back by riot police, plenty of migrants on the march felt the effort to raise their voice had been necessary. “Maybe Donald Trump could give us an opportunity. We came here to work, not to create problems or crime,” said Roberto, a Honduran attempting this journey in his late 60s. Now the Mexican government has said that anyone who took part in the protest will be deported, a threat that has undoubtedly unsettled people in the caravan. From a bright morning as the march left the camp, the mood has darkened in the knowledge that at least some among their number will be sent home simply for having joined in. An AFP journalist saw the migrants – including mothers and children – trying to protect themselves from the gas, with some crying out that they only wanted to find a work and a better life in the US. Associated Press journalist Chris Sherman said he had seen parents running away with choking toddlers. Another Honduran, Joseph Garcia, told news agency Reuters he could not bear the wait any longer.